The Pacific coast of southern Chile is a fjordland, similar to the fjordlands of northern Europe. A dissected region of islands, channels, inlets, straits, and bays, the Chilean fjords are very sparsely populated, with only a few towns and cattle ranches to be seen along the shores. 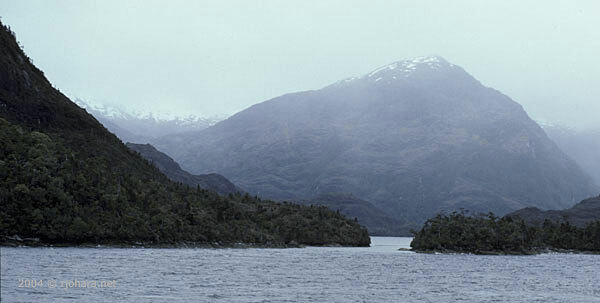 The Chilean fjords extend south into Tierra del Fuego, the territory at the southern tip of South America that is divided (often contentiously) between Chile and Argentina. These photographs of the scenery along the Chilean fjords were all taken during December and January, the mid-summer season in the southern hemisphere. They are all © Robert J. O’Hara. 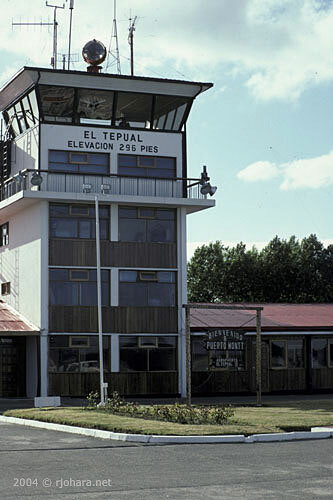 The airport terminal at Puerto Montt, Chile. The small Pacific-coast city of Puerto Montt is a common embarkation point for cruises to the Chilean fjords, Tierra del Fuego, and the Antarctic peninsula. Photo by R.J. O’Hara. 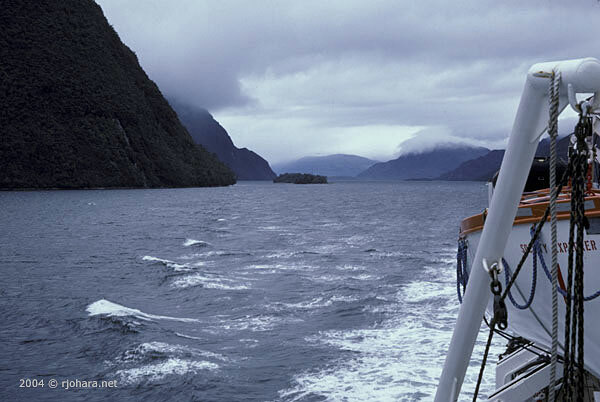 A view in the Chilean fjords from the deck of the Society Explorer (also known as the Lindblad Explorer after Lars Eric Lindblad, pioneer of Antarctic tourism. Photo by R.J. O’Hara. 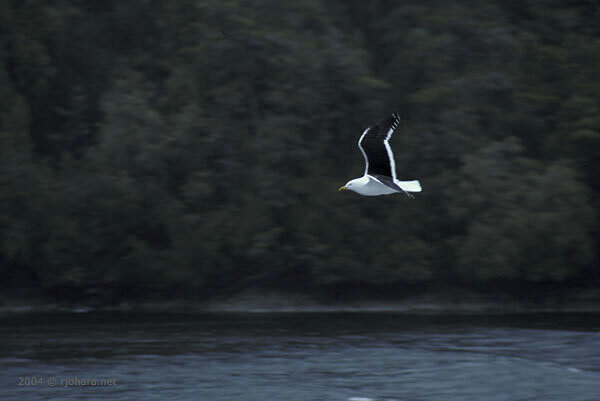 Southern Black-backed Gull (Larus dominicanus) in the Chilean fjords. The Southern Black-backed Gull is nearly identical to its northern hemisphere counterpart, the Great Black-backed Gull (Larus marinus). Photo by R.J. O’Hara. An inlet seen through the fog-shrouded fjords of Chile. Even though it is mid-summer, the peaks of many of the surrounding mountains remain snow covered. Photo by R.J. O’Hara. Giant Petrel (Macronectes giganteus) soaring through the Chilean fjords. 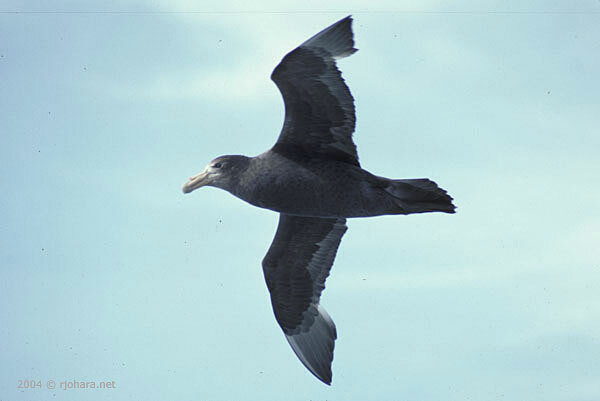 Giant Petrels are tubenose birds (Procellariiformes), the same group that includes the albatrosses and shearwaters. Photo by R.J. O’Hara. 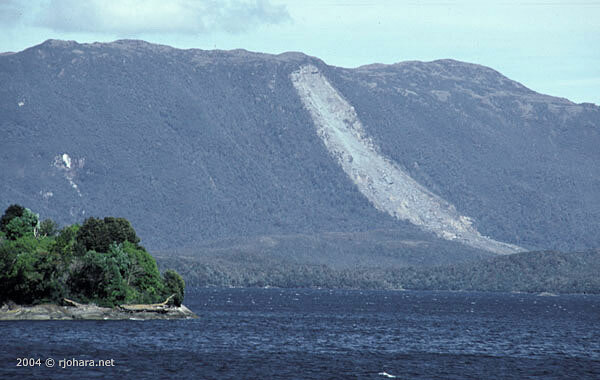 A natural landslide along the Chilean fjords. Photo by R.J. O’Hara. 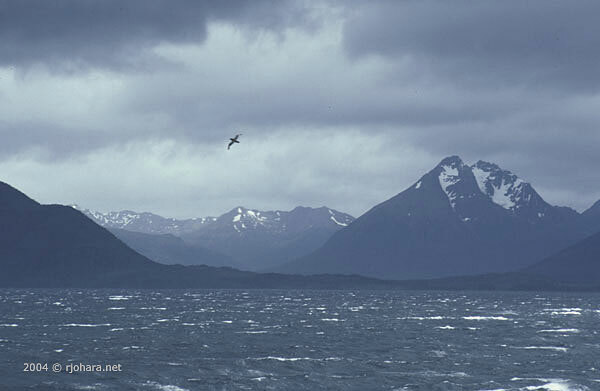 A Giant Petrel sailing over the Chilean fjords, with snow-capped peaks in the distance. Photo by R.J. O’Hara. 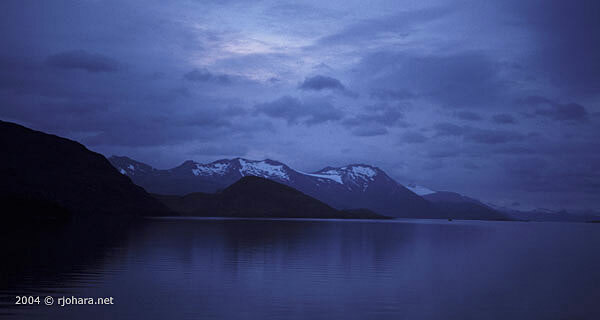 Twilight in the Chilean fjords near Tierra del Fuego. Photo by R.J. O’Hara.